Dr. Maria Montessori was a physician, scientist and educator who developed an educational philosophy based on her scientific observations of children. Her method uses special materials that arouse a child’s spontaneous interest, producing a natural concentration on tasks which does not tire or annoy the children, but rather leaves them rested, with a feeling of inner peace, accomplishment and joy. Dr. Montessori discovered that young children possess the unique ability to absorb information from their environment, much as they are able to “absorb” their native language without it being formally taught to them. In fact, they are innately compelled to learn, without need of external rewards. Furthermore, all children pass through sensitive periods during which they are particularly drawn to certain aspects of their environment; those times when the child’s brain is being wired for a particular type of information. Appropriate stimulation during the sensitive periods is essential to the child’s complete development. For example, children are sensitive to learning the names of objects at age two, so their environment should contain a wide variety of objects and pictures of objects. Dr. Montessori found that after the age of six, children are able to think more abstractly, and they are sensitive to imagination. Anything that strikes their imagination will motivate them to learn. Based on her observations of children at various stages, Dr. Montessori developed materials that both attract children and enable them to learn effectively. 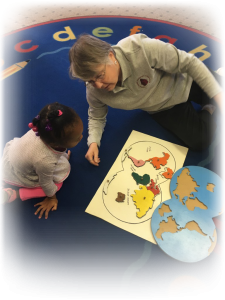 These materials are examples of the essential requisite of a Montessori learning environment – respect for the child and for the way he learns. Others include respect for the child’s choices, for his ability to work, for his need to concentrate, for his need to socialize and for his need to work alone sometimes. Even speaking to children at their eye level, rather than towering over them demonstrates respect for the child. The environment supports each individual’s unique development and aids children in becoming self-motivated, self-confident learners. The Montessori system of education is based on four focuses. The absorbent mind – birth to age 6 children use their senses to absorb large amounts of information about the environment. The sensitive periods – children are driven by their attentions and energy to develop a certain skill. Prepared environment – carefully designed and arranged by the teacher where learning can happen. 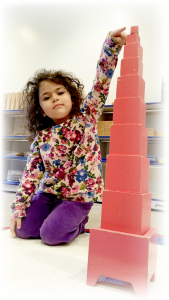 Control of error – many Montessori materials have built in self correction. Montessori is 106 years old. It can be found all over the world. There are many who hold, as I do, that the most important part of life is not the age of the university studies, but the first one, the period from birth to the age of six. For that is the time when a man’s intelligence itself, his greatest implement, is being formed. But not only his intelligence; the full totality of his psychic powers.